Saving precious time in an emergency can mean the critical difference between life and death. Guide Light 911™ was created for you to improve the margin of safety in a crisis. This new, wireless safety device makes it faster and easier for the ambulance, fire truck or police to find your home in an emergency with no monthly charges! Simple to install and easy to use! 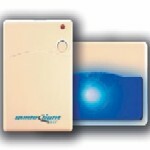 The Guide Light 911™ is a high intensity blue strobe light which is clearly visible at a distance. The blue strobe light device is installed via Velcro™ on inside of a window facing the street. Whenever you dial “911” from your telephone, the high intensity strobe light will be activated. 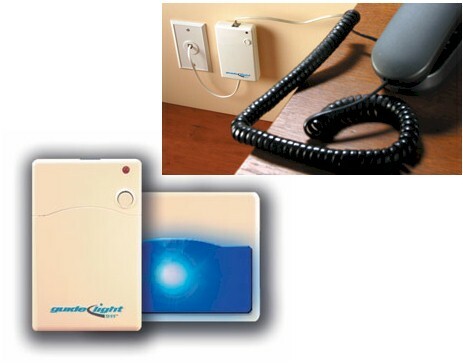 The transmitter portion of the device plugs into any standard telephone jack in your home. Guide Light 911 was created by a police officer frustrated with his inability to locate emergencies quickly enough even with Emergency 911 technology. The high intensity strobe light guides emergency personnel to your home’s exact location. Will the transmitter monitor multiple phone lines in a house or business? No, The unit is designed to monitor only one phone line that you select to detect the 911 call. Purchase additional units if you wish to install on more than one phone line. Does a telephone set have to be connected to the top of the transmitter for the unit to activate the strobe light? No, The transmitter will work from any spare RJ-11 phone jack (the normal home or business phone jack in the US) as long as it is connected to the same phone line that you would use to make a 911 call. If I need to dial 9 or another number or code to get an outside liner, will this device work? No, the transmitter is programmed to detect only the first three digits, 911 and the test codes #911 and #11. How long does the strobe light flash? The unit is programmed to flash for thirty minutes and then automatically shuts off. Redialing 911 or the test code #99 will reactivate the unit. How often to I replace the batteries? It is recommended that batteries be replaced at least twice a year, once at daylight savings time and one at standard time. Batteries should be replaced immediately if either the transmitter or strobe light low battery detectors are activated (chirp sound and LED red light.) The transmitter uses four AAA batteries and the strobe unit uses four AA batteries. Batteries are not included. A Double Package with one transmitter and two strobes is available for residences that face two streets, or multiple occupant dwellings to use one on the outside facing window and one on the door. This would aid emergency personnel to find your unit in the building quickly. Make your home easier to find in an emergency! 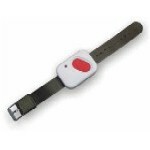 Ideal emergency protection for seniors, disabled and individuals with Skylink security products. Just press the red panic button and emergency help is summoned via activation of the receiver.